Football Star and Gor Mahia forward Dennis Oliech has launched a new “Mama Oliech” restaurant in Westlands a year after her mother Mary Auma passed on. On Tuesday,Oliech shared a video, showing off a new branch of Mama Oliech that will be taking care of their esteemed customers. “Westland next to kfc.1st floor” reads a caption from Oliech’s Video. 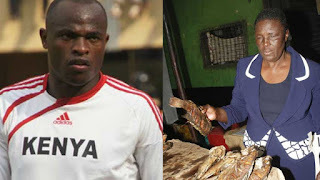 During his days of playing International Football, Oliech financed his late Mum to open their first Restaurant located in Hurlingham, Nairobi. Mama Oliech who was a widow by the time of her death, made headlines when Facebook founder Mark Zuckerberg, one of the 10 richest people in the world, ate ugali and fish at her restaurant during his visit to Kenya. The restaurant was established in 2016. “I had lunch in Nairobi with Joseph Mucheru, the Kenyan Cabinet secretary of Information and communication. We ate at Mama Oliech Restaurant- a local everyone recommend. I enjoyed ugali and a whole fried tilapia for the first time and I enjoyed them both,” posted Mr Zuckerberg on his Facebook page. In July, Mama Oliech’s Restaurant got the opportunity to prepare fish for Former USA president Barack Obama during his visit to his ancestral home in K’Ogelo. The fish was prepared by Lilian Oliech, sister to the former Harambee Stars striker. Currently, Lilian is the one in charge of their late mother’s Mama Oliech Restaurant in Hurlingham. Oliech’s new venture comes months after he joined Gor Mahia on a three year Contract.